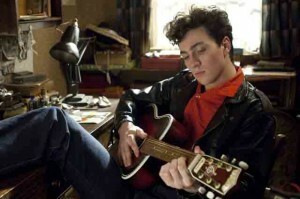 Aaron Johnson is John Lennon in Nowhere Boy. The formative, early years of John Lennon are surveyed in Nowhere Boy, a polished, emotionally biographical movie drama that was released in theaters — barely — in celebration of the singer’s 70th birthday. The focus is on Lennon (well-played by Aaron Johnson, The Greatest), as raised by his strict Aunt Mimi (Kristin Scott Thomas, The Other Boleyn Girl). As a teen, he meets his mother, Julia (Ann-Marie Duff, The Last Station), a musically astute and emotionally troubled free spirit who had abandoned him and his younger sister when he was 5 years old. First-time director Sam Wood-Taylor wonderfully captures the look and feel of working class Liverpool in the 1950s and elicits fine performances all around. The biography film also touches into Lennon’s early influences, from Elvis Presley to Screamin’ Jay Hawkins to Buddy Holly. 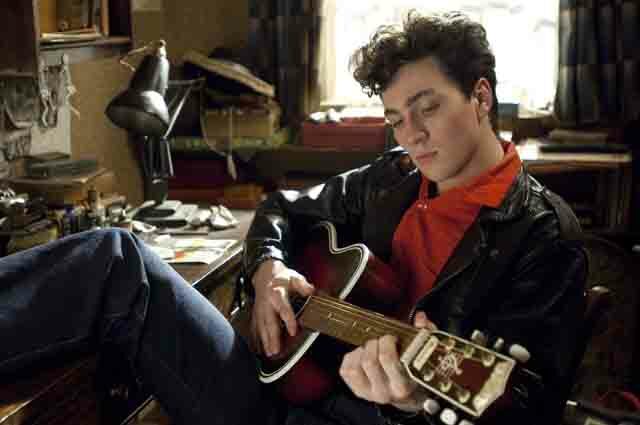 Nowhere Boy is primarily a coming-of-age story in which the protagonist is caught between two female figures and just happens to be one of the greatest musical artists who ever lived. That he rose above his post-adolescent difficulties and the tragedies depicted makes Nowhere Boy an inspiring story that ends just as Lennon’s remarkable career is beginning. The old war over rock-and-toll decency also plays a key part in the film, as Julia teaches her son how to play the banjo and inspires him to listen to the new sounds, leading him to begin a skiffle band called The Quarrymen (complete with washboard and makeshift bass), while Aunt Mimi disapproves of the music. Also given time is 15-year-old guitarist Paul McCartney’s (Thomas Brodie-Sangster) indoctrine into the group. Bonus features on the DVD include a making-of featurette and a collection of five deleted scenes.